I very often find myself on the western shores of Loch Lomond at places like The Cruin, Duck Bay, Cameron House and the Lodge on Loch Lomond. But, seldom am I over on the eastern side…only once from recollection. So, was great then to get the chance to head off to a new location for my latest pre-wedding shoot…Balmaha to be exact, for Moira & Vinny’s pre-wedding shoot. The guys are getting married next month so it was great to do a bit of a dry run and try out a few different shots in a beautiful setting with glorious weather :-). In a few months time, I’m off to the beautiful Isle of Arran for a few days to shoot Saoirse & Kenny’s wedding day and I am definitely looking forward to that :-). Before that though, I shot a pre-wedding shot with the guys over at Beecraigs Country Park, just outside Linlithgow, accompanied by their dog, who certainly didn’t mind the odd dip or two in the water. Saoirse & Kenny, thank you for going along with everything on the shoot 🙂 and I look forward to your big day in a few months. Here’s just a few of my favourites which I hope you like – click on any image to enlarge. SaoirseThank you so much, Mike. We really enjoyed our pre wedding shoot as you were so laid back and made us feel at ease. We have had so many compliments about our photos. 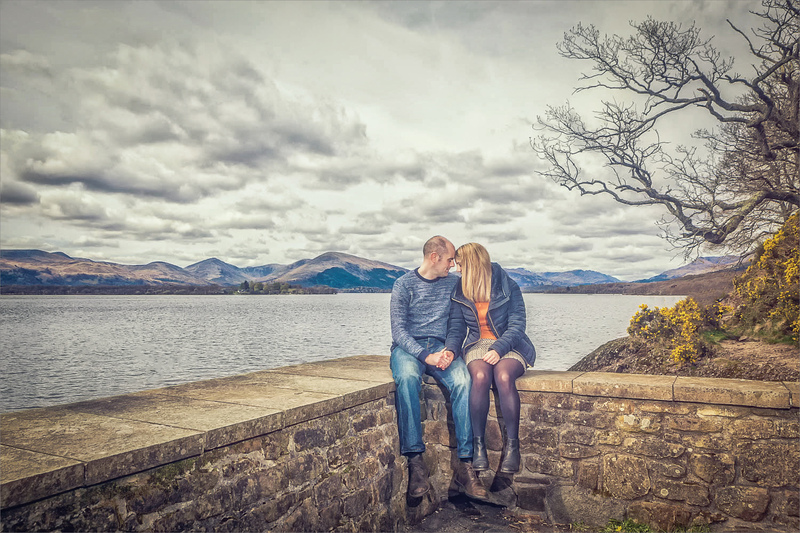 So, just as wedding season is now truly up and running, so I find myself doing almost as many pre-wedding shoots and, a few weeks ago, I was out and about in the beautiful setting of Loch Lomond, Cameron House to be exact, for Zara & Craig’s pre-wedding shoot. The guys are getting married in this very place in a couple of months so it was great to try out a few things ahead of their big day. First proper blog post of the year today guys and, this year, I’m more determined than ever to keep the blog up to date! Started off well last year, as I do every year, but then, as usual, just the sheer number of weddings caught up with me from late summer onward and the blog took a wee bit of a sidestep :-(. 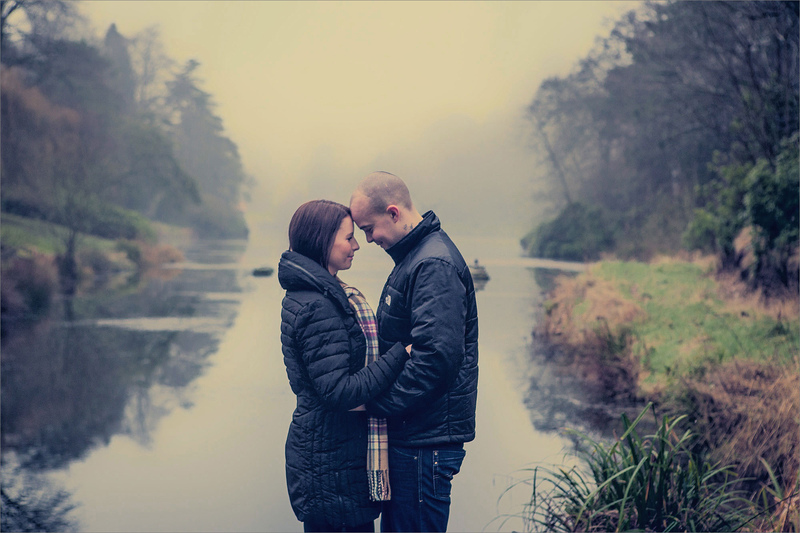 Anyway, that aside, last weekend, I was out and about at a slightly chilly, foggy, Dundas Castle with April & Callum, and their daughter Georgie :-), for their pre-wedding shoot. The guys are getting married at this very place in a couple of months and, let me just say, it really is the most amazing venue; well, not only the venue itself, but the grounds within which it’s set as well…fabulous! So, I guess it’s fair to say that the main wedding season is well behind us now for another year, although I do still have four more weddings to shoot before Santa pays a visit 🙂 but, with things calming down a touch, I’m taking to the blog to start showing you all the wonderful weddings and pre-wedding shoots that I’ve been doing this year. 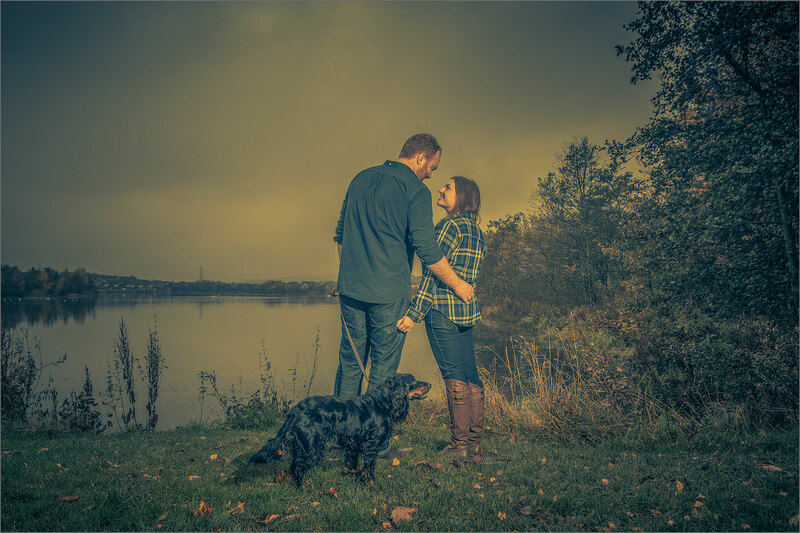 Today, I’m very pleased to be sharing a few images from Laura & Kevin’s pre-wedding shoot that we did over at Broadwood Loch and thereabouts. Bit of a misty, murky day weather wise but I actually think that gives a nice feel, especially to the shots in front of the loch. The guys brought their dog along with them as well and, whilst I dare say National Geographic won’t be calling on my door anytime soon, I’m still quite pleased with the shots we got.